Periodically I'll target certain keywords in Google just to test certain SEO techniques. 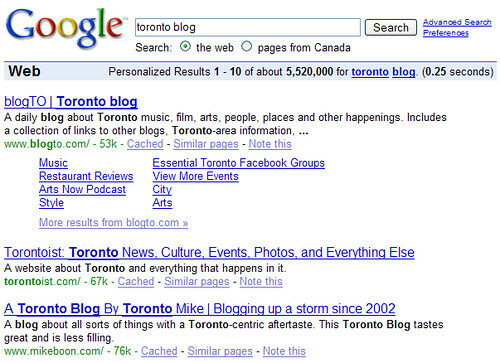 When I picked up the domain name torontomike.com to complement torontomike.com, I decided I should target the search toronto blog. This is, after all, a blog with a Toronto-centric angle. With fairly little effort I started ranking in the top ten on Google, but I seem stuck in either the 3rd or 2nd spot. There are a couple of bigger boys targeting the same keywords and they're tough to catch. Quite simply, they have a helluva lot more inbound links with the anchor text toronto blog. I just took the screen cap below that currently shows me in 3rd. I'll update this little challenge when I'm on top of the Toronto blog food chain. You're actually number four if use Google.com instead of Google.ca. But that's still pretty darn good, I'd say. And I did it without showing my boobies once! Oh so that is the secret to being googles one, two or three ~ It's not the key words it's boobies! Hey Mike, I think the other two are only about Toronto, while you have a lot of personal stuff too. And that's why we come here, right guys?